It’s November 29, and that means it’s exactly 119 years since Hans Gamper called his historic meeting at the Solé Gymnasium to form the Barcelona Foot-Ball Club. Born in Winterthur near Zurich on 22 November 1877, Gamper was an accomplished sportsman who excelled at athletics, golf, cycling and many other disciplines. But football was his true love, and after helping to found FC Zurich in his home country, and also playing rugby while working in Lyon, he eventually arrived in Barcelona 1898 to start work for the Sarrià tram company. On 22 October 1899 he published his famous notice in Los Deportes magazine, calling on foreigners and locals alike to join him in forming a football club in the Catalan capital. Nine days later, on December 8, the old velodrome at Bonanova was the venue for the team’s first ever game, against members of the English community living in Barcelona. 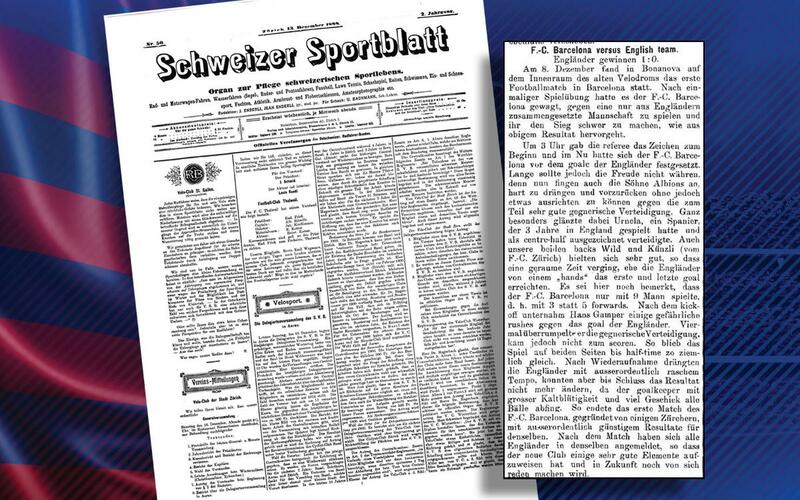 Gamper was so proud of his achievement that he even wrote a piece for Schweizer Sportblatt, the Swiss sports magazine that he often contributed to. The article was mentioned by the curator of the FC Zurich museum, Saro Pepe, in the recent Gamper documentary, and a digital copy and translation were recently passed on to the FC Barcelona Documentation and Study Centre. Originally published on 13 December 1899, it’s quite a find. Although the game between FC Barcelona and the ‘English Colony’, which ended 1-0 to the latter, was reported in several local papers, this account, written by the founder himself, includes a few new details about the occasion and the players involved. Gamper claims Barcelona only had nine men (as opposed to the ten named in the Catalan papers) so they opted for a somewhat unorthodox 2-3-3 formation and he also confirms that their English opponents decided, once the game was over, to join forces with Gamper and his new club. A few weeks later, a second meeting would indeed be held, at which FC Barcelona ‘merged’ with the English expatriates. On December 8 at Bonanova, inside the Old Velodrome, the first game of football was played in Barcelona. After just one training session, FC Barcelona dared to take on a team made up entirely of Englishmen, and to make it hard for them to win, as the final result shows. At 3 o’clock, the referee gave the signal for play to commence, and FC Barcelona immediately positioned themselves in front of the English goal. But the joy would not last long, because the sons of Albion soon started pressing strongly up the field, but without being able to do anything against the enemy defence, which was partly very good. Especially good was Urruela, a Spaniard who played in England for three years and defended the goal brilliantly. Our two defenders, Wild and Künzli (from FC Zurich) held themselves very well, so it took a long time for the English to score the first only goal following handball. We should note that FC Barcelona only had nine men, in other words, three forwards instead of five. After the kick-off, Hans Gamper made some dangerous runs against the English goal. He surprised the opposing defence four times, but didn’t manage to score. The game continued practically equal for both sides until the interval. After the restart, the English played at an exceptionally rapid pace, but could not change the score, as the goalkeeper stopped all the balls with much coolness and skill. So ended the first game for FC Barcelona, founded by a man from Zurich, with an exceptionally favourable result for them. After the game, all of the Englishmen joined the team, so the new club has some very good players and will make itself heard in the future.